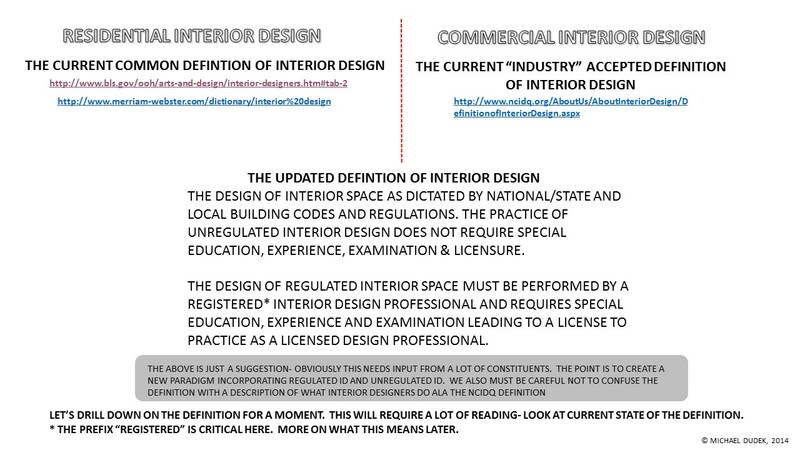 PROFESSIONALINTERIORDESIGNER has posted many times regarding the issue of California and its private self-regulated, voluntary Interior Design certification program. While California is the largest interior design market in the nation it remains an anomaly in the big picture of the domestic U.S. 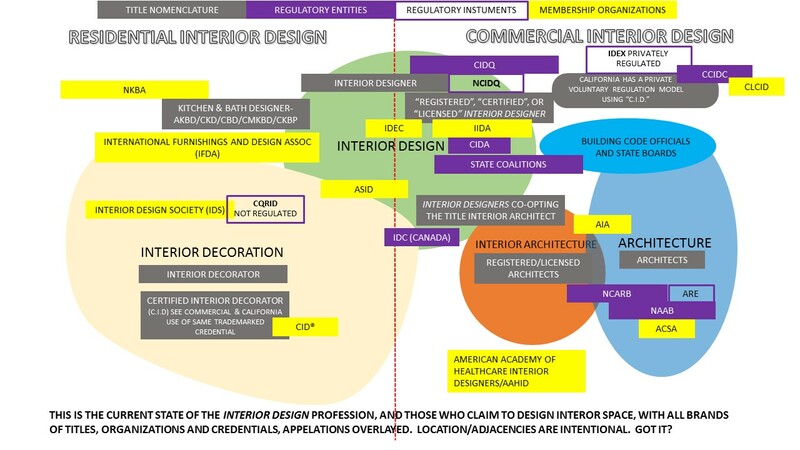 Interior Design profession’s efforts to establish nationwide practice licensure status. 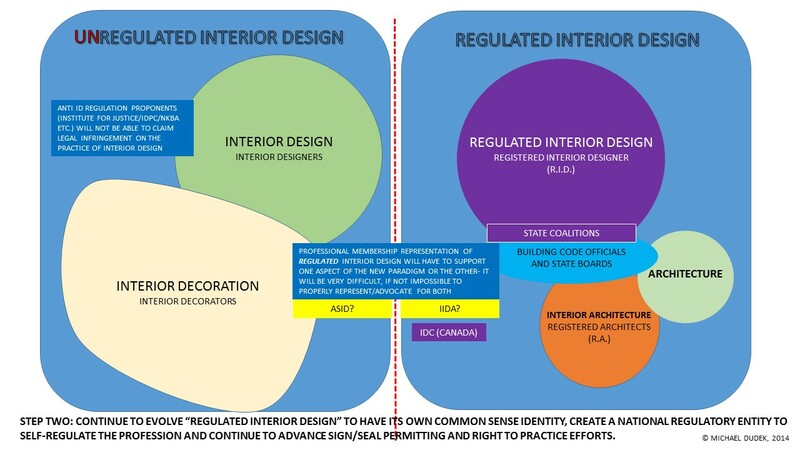 I have just finished reading and trying to understand the latest effort to better align the CCIDC efforts to do what it believes is in the best interest’s of California’s Certified Interior Design community with the IDCC’s goal of opening the door to some sort of mutually beneficial effort. Not sure I fully understand IDCC’s approach but it is clear that CCIDC is not interested. Although I am simply an outside observer here and one might say I do not have a dog in this hunt-well you would be wrong. We all have an interest in how California,the other 49 states and 10 Canadian Provinces present a unified and strong professional front. Sadly being able to play nicely in our one big sandbox is just a dream. Seems the California Council of the AIA (or a related chapter) is trying to corner the market on the permit review process in California under the guise of assisting over worked/over burdened and under staffed building permit departments. California Assembly Bill 2192, ( http://leginfo.legislature.ca.gov/faces/billNavClient.xhtml?bill_id=201320140AB2192 )which is currently in committee, proposes a limited pilot program that will allow permit documents to be reviewed for approval by other architects…….That is, where local codes require that permit drawings be stamped and sealed by an architect that another architect, on behalf of the local jurisdiction, can review and approve those documents to be permitted…..It is unclear to me how a set of non-seismic/non-structural permit drawings signed and sealed by a Certified Interior Designer will be considered under such a scheme….but I can imagine that since the fox will have the key to the hen-house door that the cost of entry might go way up. Yes this is only a limited proposal and the bill may never move out of committee but to an anti-government/less government mindset this appears to be a brilliant proposal. Many building/permit departments already employ architects as plan reviewers and building officials. If successful the quasi-privatization of local building departments could become a trend…..a stretch maybe but hey this is California….anything can happen and if it catches on Katie bar the hen-house door. BUT……………..besides the potential issues of bias and favoritism..not that that would ever happen amongst fellow professionals….it just seems that the AIA is using this to idea to monopolize the building permit process which cannot be positive for California’s already sketchy CID permitting process. AB 2192 (Melendez), the AIACC-sponsored legislation to create a pilot program for three local jurisdictions to implement an alternative plan review process for residential design, has been dropped and is now dead. While the author’s office and the AIACC were confident we would be able to move this bill out of the Legislature and to the Governor for his consideration, the good question the author asked was why move the bill if no local jurisdiction has been found that is willing to implement the alternative review process? Our bill would have implemented a pilot project in three local jurisdictions that would have allowed residential plans prepared by architects to be reviewed by another architect, and that “peer review” would have been in lieu of plan review by the local jurisdiction. Thus, a building permit would have been issued upon the submittal of “peer reviewed” plans. Many groups opposed this bill, including the California Building Officials, California Architects Board (oppose unless amended), and several interior design groups. We, and the author’s office, were unable to find any local building department interested in becoming a part of this pilot project, causing the author to question the need to move the bill. Initially, the bill would have given all local building departments the authority to implement this alternative plan review program, at its discretion, but we had to amend it to a pilot program for three jurisdictions in order to get the bill out of the State Assembly, which we did on a 72-4 vote. Unfortunately, with that amendment, we needed to find local jurisdictions in a short amount of time who were willing to be a part of this program, and we were not able to do that. There are several irrefutable facts, based on my opinion, regarding our professional identity crisis that requires us (okay…me) to reconsider our current professional paradigm. 1. Interior Decoration and Interior Design will forever be entwined. The general public will always think of us as interior decorators (not that there is anything wrong with interior decoration). No amount of government mandated title legislation will change this perception. 2. The past effort to own the term “interior design” and shift the meaning and standards for individuals to call themselves interior designers and practice interior design has failed. 2. Our current professional membership organizations are incapable of addressing this identity crisis in a meaningful and non-divisive manner. I will acknowledge that there has been some progress particularly on the sign/seal permitting front but given the disconnect between our professional member organizations, their professional and non-professional members and our policy makers this “progress” has been too slow and too costly. SO DO WE CONTINUE TO SOLDIER ON AT GREAT EXPENSE (TIME/MONEY/INTELLECTUAL CAPITOL) WITH MARGINAL RESULTS? That would be the easiest thing to do right? Given the dearth of options it makes sense. Of course there are those who choose to leave this madness behind them by co-opting the term “interior architect” even though they are not architects registered, licensed or otherwise. Can’t say I blame them and before I really dove into this issue from the perspective of a practitioner turned academic I also ignored the time honored stereotypes by calling myself an interior architect. PROFESSIONALINTERIORDESIGNER actually considers this semantic co-opting to be a legitimate option to solve our identity/societal respect issue. 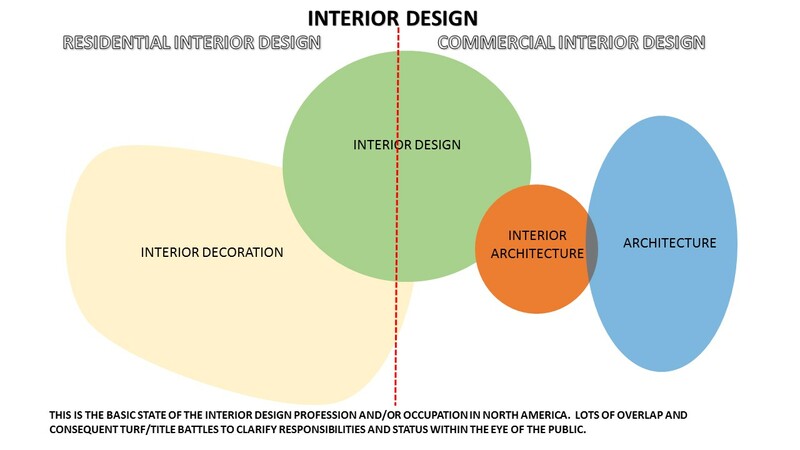 If we assimilate the term “interior architect” and change all of the legal trappings that would allow interior designers to call themselves interior architects and legally practice interior architecture this professional pathway MIGHT work. But IMO the effort required to make this shift is insurmountable. I have a better idea. Here is my first step of a several step plan to reinvent the profession of interior design…no really that is what I am doing……well if you have a better idea I am happy to listen. There are two types of interior design. 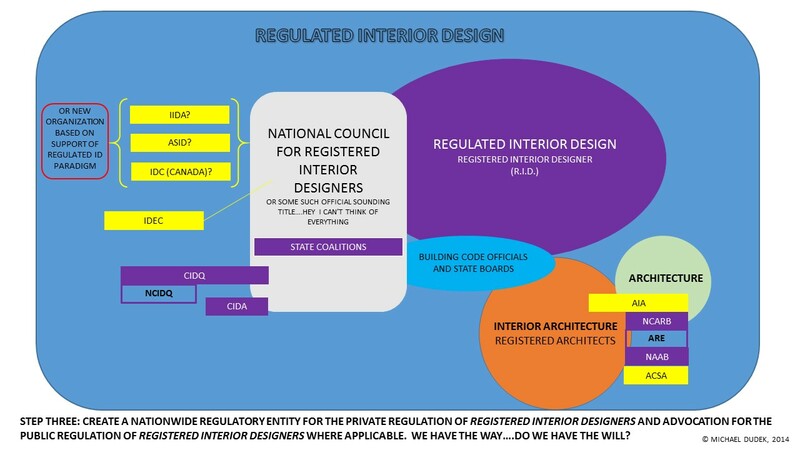 Unregulated Interior Design and Regulated Interior Design (refer to cool graphics). No longer will we be sucked into the never-ending debate about interior decoration vs. interior design, or residential vs. commercial interior design. It is simply unregulated ID or regulated ID. The distinction here is clear. For 50+ years we have been looking to Uncle Sam to help us validate our efforts to be design professionals….well he’s already done it for us. 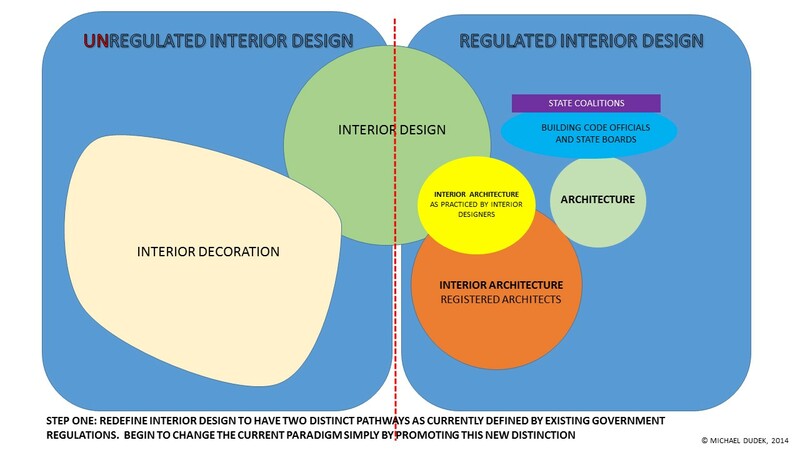 The evolution of the profession of Interior Design has reached a point where difficult decisions must be made in order for it to advance to the next level which is TRUE parity with other licensed design professionals. We must provide a clear and powerful message about our right to be considered peers with our allied design professionals. This will not happen organically, by chance or one acquaintance at a time. It will take courage, patience and commitment. Crazy as it sounds I do not think it will take more work……we just have to be much more strategic about where we dedicate our financial, physical and intellectual resources. That’s my plan and I am sticking with it. 4 MORE YEARS….4 MORE YEARS! Looks like the CID’ers in California get four more years to practice…..and four more years to convince state building officials that they are in fact qualified to sign and seal CD’s for limited scope code regulated interior work. And that the CID credential is more than just a title. Nobody cares about signing and sealing work that does not absolve an independent interior designer from hiring another licensed design professional simply to obtain permission to see their work to fruition. The requirement for transparency and open meetings was brought on by ASID. So it will be interesting to see how CCIDC and ASID play in the sandbox. Evidently the A.I.A. was just testing its cannons. The stakeholder meetings, if they happen, should be televised for the public record.